Robert Uecker is an American former Major League Baseball player and current sportscaster, comedian, and actor. Facetiously dubbed “Mr. 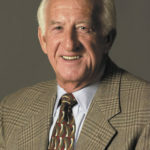 Baseball” by TV talk show host Johnny Carson, Uecker has served as a play-by-play announcer for Milwaukee Brewers radio broadcasts since 1971. He was honored by the National Baseball Hall of Fame with its 2003 Ford C. Frick Award in recognition of his broadcasting career. "I set records that will never be equaled. In fact, I hope 90% of them don’t even get printed." "I hope the fans have enjoyed listening as much as I’ve enjoyed doing the games. I don’t ever go to the park where I don’t have a good day. I don’t like losing. But I don’t think I ever go to the park where I have a bad day. I don’t think once." "I make fun of situations and try and find the humor in things, but it’s never at the expense of the other guy." "The biggest thrill a ballplayer can have is when your son takes after you. That happened when my Bobby was in his championship Little League game. He really showed me something. Struck out three times. Made an error that lost the game. Parents were throwing things at our car and swearing at us as we drove off. Gosh, I was proud."